David Lummis, CEO of the British Safety Industry Federation, discusses the importance of correct fitting Respiratory Protective Equipment and factors to take into account when selecting such equipment. It is a sad fact that thousands of workers develop lung problems and cancer each year as a result of breathing in harmful quantities of dust, fumes or other airborne contaminants at work. Where toxic substances are present in the workplace and engineering controls are inadequate to reduce or eliminate them, the supply and use of Respiratory Protective Equipment (RPE) is necessary. RPE is a type of Personal Protective Equipment (PPE) designed specifically to protect the wearer against inhaling hazardous substances in air. Consequently, when employees must work in environments with insufficient oxygen or where harmful dusts, smoke, mists, fumes, gases, vapours or sprays are present, RPE is vital. It should be noted that RPE must only be used as the last line of defence as it only protects the wearer; it may interfere with work; it might be uncomfortable to wear and intrude into normal activities; and if it is used or maintained incorrectly, it is unlikely to give adequate protection. Correctly fitting and maintained RPE is therefore essential to protect workers from airborne risks. Approximately 5.5 million workers are exposed to respiratory hazards in the UK workplace and research carried out by the British Safety Industry Federation (BSIF) and the UK’s Health and Safety Executive (HSE) has highlighted concerns that RPE is not being effectively selected, used and maintained in a significant proportion of workplaces where a respiratory hazard exists, leaving workers at risk. Current UK laws and regulations place a heavy legal obligation on employers to adhere to the requirements set out, and to ensure that they provide a safe working environment. While these laws may not be translated worldwide, this should be something that all employers strive to provide their workforce, whether mandatory or not. For example, in an oxygen deficient or other hazardous environments, the following occur more quickly: increased breathing rates, accelerated heartbeat and impaired thinking or coordination; even a momentary loss of coordination can be devastating if it occurs while a worker is performing a potentially dangerous activity. The use of RPE in such instances is pivotal for a healthy and safe workforce; however, many workers are unaware of the danger of incorrectly fitted RPE and although wearing the correct equipment, are still at risk of developing an illness. In order to select the correct RPE, a proper risk assessment needs to be carried out of the hazards presented to the workforce, ideally by a qualified professional. In large organisations this may be carried out by the company’s own dedicated health and safety officer, whereas smaller organisations may need to engage an outside consultant to ensure the correct RPE is selected. The risk assessment will take into account industry benchmarks and legal standards, plus a number of areas will be covered including: identification of the hazard, the workplace exposure level, measuring the concentration of any contaminate, the length of exposure, the workload of the person wearing the RPE and their general fitness levels. It is only once the risk assessment has been completed and the various factors have been measured against the correct standards that the employer is able to make an informed decision about the type of RPE required to protect workers in any given situation. It should be noted that RPE should only be used as a last resort if other means of controlling substances hazardous to health are inadequate and additionally, it should be used in conjunction with other means of control. 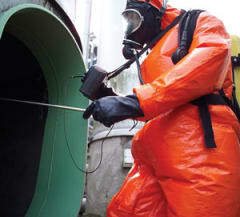 In atmospheres where there may be insufficient oxygen (for example in confined spaces such as tanks or pipes), it is essential that oxygen levels are measured and, where required, breathing apparatus is supplied to ensure the workers are adequately supplied with breathable air. It should be noted that respirators just using filters to remove airborne hazards do not supply any additional oxygen and should not be used in oxygen deficient atmospheres. Specialist advice may be required to ensure that correct breathing apparatus is supplied. Following the risk assessment, the advisor will be able to suggest the correct RPE. The right respirator will be: specifically for a particular hazard or hazards, offer the correct amount of protection and be suitable for the user, the work and the environment. There are two types of RPE - Respirators and Breathing Apparatus. Respirators are used to filter contaminants and harmful particles found in the workplace environment and must never be used in confined spaces, areas of low oxygen levels or very high contaminant levels. Breathing Apparatus, on the other hand, uses breathing quality air from a supplied source such as an air cylinder or air compressor. 1. Worker medical condition - wearing respiratory protection can pose a physical burden on the wearer if they suffer from an existing or previous medical condition. When a worker's medical condition would prohibit restrictive breathing conditions, negative pressure respirators would not be an appropriate choice. 2. Worker comfort - worker preferences should be taken into consideration during the respirator selection process. Comfort and wearability is important: if a mask is uncomfortable then it’s difficult to get people to wear it. 3. Freedom of movement - some jobs require more mobility than others: this is something that needs to be taken into account. 4. Facial anthropometry - the shape, size and characteristics of a face can influence the choice of equipment. 5. Facial hair - any facial hair, whether stubble, moustaches or beards can affect the fit of RPE. Essentially a close fitting mask should not have facial hair interfering with its fit; however, if facial hair needs to be retained for religious, ethnic or other reasons, alternative RPE needs to be carefully selected. 6. Mutual compatibility - when other personal protective equipment must be worn it is important that they work together, for example some masks may affect the performance of goggles. 7. Field of vision/good verbal communication - some jobs require one or both of the aforementioned. RPE can affect this so careful selection is required. The market is extensively supplied through various manufacturers of RPE products, which of course can be overwhelming for the decision maker within the organisation with regards to which brand to select on behalf of each worker. However, by having a risk assessment carried out and RPE recommendations made, this will help make the selection process easier. Comfort, choice and practicality in use will be among the key decision makers when selecting the equipment. A number of initiatives are in place to help raise awareness of RPE and the importance of its proper use. The BSIF and the HSE, together with a number of other safety industry stakeholders, have developed the ‘Clean Air? Take Care!’ campaign. Their research highlighted two major concerns. Firstly, RPE is often not being selected properly and secondly, in a significant number of companies, RPE is not being used at all, even though there is a clear respiratory hazard. Therefore this campaign aims to help reduce occupational respiratory disease caused by ineffective use of respiratory equipment in the workplace by raising awareness of the issues that surround it, and highlighting the importance of selecting the correct respiratory protective equipment. An extensive selection of tools is available to support this campaign, including a simple RPE selection guide and an informative user poster that can be downloaded from the website: www.cleanairtakecare.org. A campaign DVD is also available that features two films aimed at safety managers. The first outlines the correct use of RPE to users, while the second gives a medical view of the need for adequate protection and the consequences of ignoring it. The HSE has highlighted that approximately 12,000 deaths occur each year in Great Britain from respiratory diseases caused by occupational exposure. By getting involved in the Clean Air? Take Care! campaign and working together, we can substantially help reduce that number. Visit the website (above) for further information. Poor or uncomfortable fit is one of the main excuses for workers’ reluctance to wear any kind of RPE, and it is a frightening fact that the fit of the equipment can in many cases mean the difference between life and death, or at the very least, the onset of long term respiratory problems. In 2009 the BSIF, in collaboration with the HSE and other industry stakeholders, launched the ‘Fit2Fit Fit Test Providers Accreditation Scheme’, which is a competency scheme that has the overall aim to significantly reduce the incidence of occupational respiratory injury. The scheme highlights the need for RPE to be fitted properly after it emerged that many workers’ RPE does not achieve the correct level of protection due to poor fit. Where RPE is deployed, the issue is not necessarily with the quality of the equipment, but with the fact that it is not being used or fitted properly. There is not just a moral obligation to correctly protect employees, there are also legal implications. UK health and safety regulations stipulate that RPE must be correctly selected and those using the equipment should receive adequate training. Where a face seal is necessary, an appropriate fit test must be conducted by a competent person - and this is one area where it is critical a careful test is undertaken. This scheme is designed to confirm the competency of any person performing face piece fit testing by passing an industry recognised exam, followed by a practical assessment. These assessments demonstrate that they have a thorough knowledge of the HSE guidance on fit testing and that they know how to fit test inpractical circumstances. Up until 2009, UK fit testers of RPE were not accredited, making the selection of a competent person a matter of luck and guess work. There may be a lack of knowledge, skills, experience and understanding of fit testing, or these may have deteriorated over time. Either way, the wearer of the equipment will be risking potential respiratory health problems if the RPE is ill fitting. The scheme was designed specifically to tackle this issue. More than a year and a half on and the scheme is going from strength to strength, as Fit Test Providers continue to realise the benefits associated with training up to be a competent RPE face fit tester. A fire safety organisation was one of the first companies to join up to the scheme in 2009, and now has a number of Fit2Fit Fit Test assessed/accredited technicians. Its managing director said: “All of my staff who may have cause to conduct a Fit Test were submitted for assessment and this has now become part of my company culture. As new recruits join and gain experience, they in turn are put forward for assessment for both the quantitative and qualitative tests. “I think in many cases, customers take some assurance from the qualification as it shows that our Fit Test Technicians are competent and suitably qualified to provide the service they offer to a nationally recognised standard. Mike Clayton, Senior Scientist at the Health and Safety Laboratory said: “The HSE is keen to improve the quality of RPE programmes in the workplace and the Fit2Fit Fit Test Providers Scheme is certainly one way of helping combat the problem of RPE fit testing competency and is contributing to our plan. “While we appreciate raising the competency of fit testers is a long term process, the scheme supports and improves the selection of RPE. Consequently, as the scheme develops and HSE inspectors become more aware of Fit2Fit, they will start to ask further questions on competency. While the problem of respiratory disease in the workplace is still a cause for concern, work is clearly underway to reduce the problem. Over the next few years industry stakeholders will undoubtedly continue to raise awareness on the topic, with the aim to reduce respiratory problems in the workplace further.